Shopping for Yummy Key Chains? Things are getting fresh in Sprinkletree! Each cool key chain comes with a detachable lobster clasp. Add something fresh to your keys, backpack, purse, or zipper! Display tray contains 24 randomly selected, blind-packaged key chains. 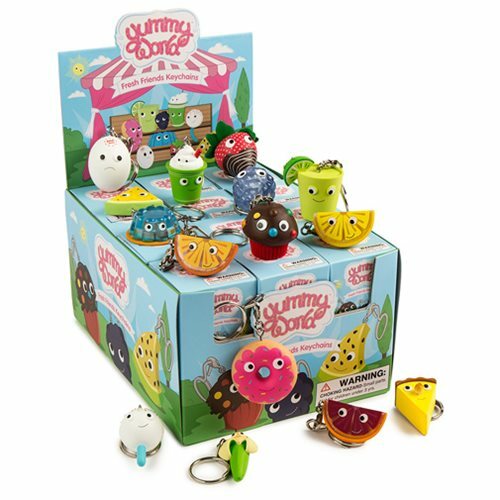 The Yummy World family is making room for this cool key chain series that's full of citrusy sweet fresh treats! These Yummy World Fresh Friends Key Chains include a detachable lobster clasp, perfect for adding a new take to any set of keys, backpack, purse, or zipper, and each comes blind boxed for a surprise every time. Collect the whole gang to make sure your Yummy World collection stays extra fresh! This Yummy World Fresh Friends Key Chain Display Tray contains 24 randomly selected, blind-packaged key chains. Please note: Item selection is random. Items are in blind packaging. We cannot accept requests for specific items, nor can we accept returns on opened items. You may receive duplicates. Ages 3 and up.